A Lightweight, Cheap and Functional Geared Tripod Head? Freedom comes at a cost.. Amateur Photographer who plays with big cameras and film when in between digital photographs. The live stream we recently broadcast about tilt and shift in landscape photography goes through an awful lot of ground on this subject, a lot of which could benefit from some written explanation. I’m not going to try to do all of this in one issue though, so I thought I’d start with an overview of the different ways of focussing a DSLR tilt shift lens. 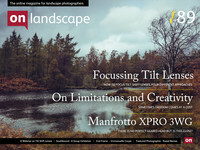 In this issue I’ll show you a method that relies on the way that the camera behaves with tilt and a quick way of applying the technique using look up tables. I’ll also show a method that relies on a point that stays in focus when you tilt and finally an iterative approach. Knowing all of these methods will give you a broad knowledge of what is happening when you change tilt and focus on your DSLR lens. The first method I demonstrated in the video was based on Merklinger’s hinge line. More correctly it’s actually Scheimpflug’s Hinge Line. Merklinger’s Hinge Line is a second condition that combined with Schiemplug’s Hinge Line defines the focal plane - more later. This says that the plane of the sensor or film meets the lens plane at a line and that the focal plane will also pass through this line. If we look a side view of the camera, things become clearer working in two dimensions. So if we draw a line down the back of the camera and a line through the lens they meet at a point through which the focal plane will also pass as above. The two red lines are possible planes of focus depending on whether you have focussed closer or further away. This is a premium article and requires a paid subscription to access. Please take a look at the subscribe page for more information on prices.